The theme has a tech look and obscure colors (grey and blue), it is based on BlueSteel of bluepearl-design, suitable for professional websites like general discussion forum, hosting forum, tech forum etc. Is has compact footer, and newly designed panel. The theme makes use of CCS3, to show some details such as rounded corners and shadows, as well as the buttons on "New Topic", "Locked Thread" and "New Response", visible in the last generation browsers (not Internet Explorer). The is suitable for 1.6 but it can be also used in older version but its not recommended. 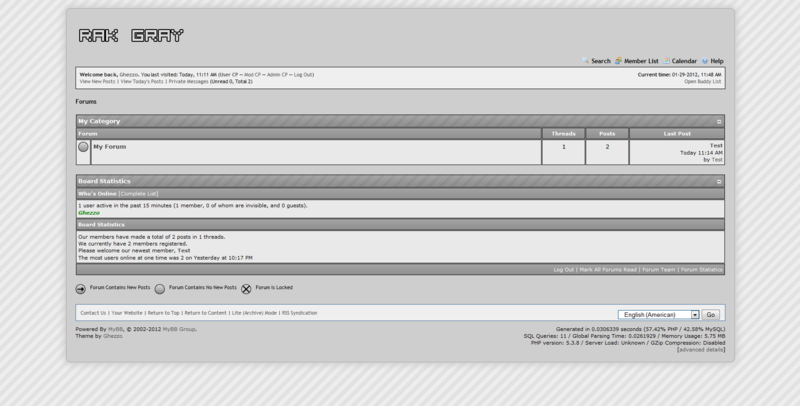 1) Upload the contents of the folder "upload" to the root of your MyBB forum. 2) Import included theme XML into your Admin CP > Templates & Style > Import a Theme. 3) Switch to the new theme via your User Control Panel!